Summary: A new study in Nature Communications refutes long standing belief, reporting that cerebrospinal fluid exits the cranial cavity via lymph vessels. Our brain swims. It is fully immersed in an aqueous liquid known as cerebrospinal fluid. Every day, the human body produces about half a litre of new cerebrospinal fluid in the cerebral ventricles; this liquid originates from the blood. This same quantity then has to exit the cranial cavity again every day. Researchers in the group led by Michael Detmar, Professor of Pharmacogenomics, have now published a study showing that in mice, the cerebrospinal fluid exits the cranial cavity through the lymph vessels. The ETH Zurich researchers have thus identified another central role played by the lymphatic system, and refuted a decades-old dogma. The scientists have published their findings in the latest issue of the scientific journal Nature Communications. Past research has inadequately explained how cerebrospinal fluid exits the cranial cavity. Scientists knew that two paths were available – blood vessels (veins) and lymphatic vessels, but for a long time, and due due to insufficient research tools, they had assumed that drainage through the veins was by far the predominant pathway. The researchers led by Steven Proulx, Senior Scientist in Detmar’s group, have now been able to refute this assumption. They injected tiny fluorescent dye molecules into the ventricles (cavities) of the brain in mice and observed how these molecules exited the cranial cavity. They used a sensitive non-invasive imaging technique to examine the blood vessels in the periphery of the animals’ bodies, as well as the lymphatic and blood vessels directly draining the skull. It turned out that the dye molecules appeared after just a few minutes in the lymphatic vessels and lymph nodes outside the brain. The researchers were unable to find any molecules in blood vessels so quickly after the injection. They were also able to determine the exact path of the dye molecules and thus the cerebrospinal fluid: it leaves the skull along cranial nerve sheaths – in particular around the olfactory and optic nerves. “Once in tissue outside the brain, it is removed by the lymphatic vessels,” explains Qiaoli Ma, a doctoral student in Detmar’s group and lead author of the study. The scientists are not entirely able to rule out whether a small portion of the cerebrospinal fluid also leaves the brain as previously assumed – through the veins. However, based on their research findings, they are convinced that the lion’s share travels through the lymphatic system, and that the anatomy textbooks will have to be rewritten. This flushing function could offer a starting point for treatment of neurodegenerative diseases such as Alzheimer’s. Alzheimer’s is caused by misfolded proteins that accumulate in the brain. Proulx and his colleagues speculate that these misfolded proteins could be eliminated by, for example, drugs that induce lymphatic flow. Similarly, studies could be undertaken to examine whether it is possible to manage inflammatory diseases of the central nervous system, such as multiple sclerosis, through influence of the lymphatic flow. The scientists also showed that much less cerebrospinal fluid flows out of the brain in older mice than in younger ones, presumably because less fluid is produced in old age. Since Alzheimer’s and other forms of dementia occur in old age, the researchers think it will be interesting to examine whether stimulation of the flow of cerebrospinal fluid could slow down the progression of dementia. This is the question the ETH scientists would like to explore next in a mouse model. Scheme outlining the CSF outflow routes to the mandibular lymph nodes. Green: lymphatic vessels with black arrows indicating direction of flow, red: facial arteries. NeuroscienceNews.com image is credited to Proulx et al./Nature Communications. Detmar’s group has already shown that other diseases outside the brain can be treated by stimulation of the lymphatic flow. In the case of rheumatoid arthritis and psoriasis, the researchers succeeded in relieving symptoms through stimulation of the lymphatic flow. The researchers say that studies on cerebrospinal outflow in humans may be conceivable in the future. The fluorescent marker molecule does not trigger an immune reaction and is efficiently eliminated by the body. Before the molecule can be used in humans, the scientists must first apply for the necessary approval. “Research on the lymphatic system did not receive the attention it deserved until recently. Some in the scientific world have even ignored the lymphatic system altogether,” says Proulx. Now that the ETH scientists have succeeded in demonstrating another important function of the lymphatic system, they hope that it will attract greater attention in scientific research. 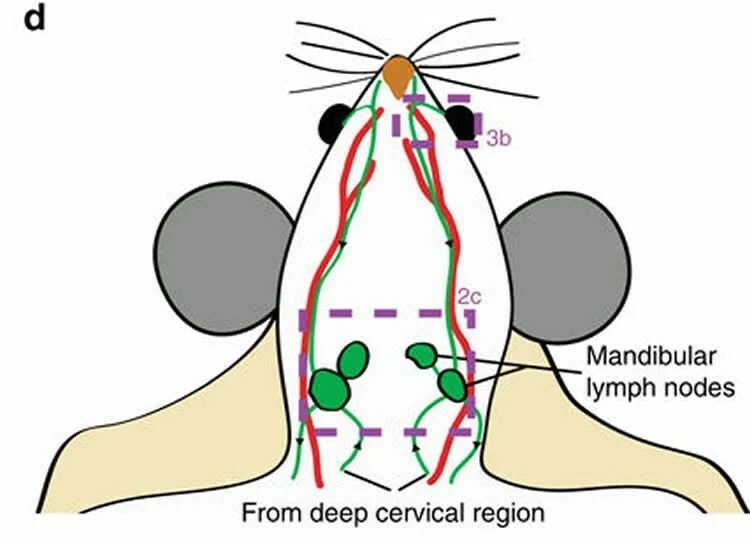 Image Source: NeuroscienceNews.com image is credited to credited to Proulx et al./Nature Communications..
ETH Zurich “Exit Through the Lymphatic System.” NeuroscienceNews. NeuroscienceNews, 10 November 2017. ETH Zurich “Exit Through the Lymphatic System.” http://neurosciencenews.com/lymphatic-system-cranial-cavity-7912/ (accessed November 10, 2017). Cerebrospinal fluid (CSF) has been commonly accepted to drain through arachnoid projections from the subarachnoid space to the dural venous sinuses. However, a lymphatic component to CSF outflow has long been known. Here, we utilize lymphatic-reporter mice and high-resolution stereomicroscopy to characterize the anatomical routes and dynamics of outflow of CSF. After infusion into a lateral ventricle, tracers spread into the paravascular spaces of the pia mater and cortex of the brain. Tracers also rapidly reach lymph nodes using perineural routes through foramina in the skull. Using noninvasive imaging techniques that can quantify the transport of tracers to the blood and lymph nodes, we find that lymphatic vessels are the major outflow pathway for both large and small molecular tracers in mice. A significant decline in CSF lymphatic outflow is found in aged compared to young mice, suggesting that the lymphatic system may represent a target for age-associated neurological conditions. Fantastic! If you need a person on which to test , my brother will. I am a certified lymphedema and wound therapist and Occupational therapy practitioner and have long seen the significant changes with my MS patients not only in the decrease of lymphedema swelling in their extremities but in an overall improvement in their MS symptoms. Some of my patients have improved so substantially as to be able to stop using a wheelchair and only need a wheeled walker to ambulate. Flare ups decrease and overall quality of life improves. It is nice to finally have evidence that the changes I have seen with the use of Complete Decongestive Therapy has physiological bases far reaching just clearing lymphedema inferior to the neck. Thank you for this informative and exciting research on the importance of the lymphatic system and csf drainage. What roll does chronic lymphatic leuchemia play in csf drainage? Can nutrition (specific diet) improve on this condition? Thank you for this amazing research. Great information. What test is best to show human lymphatic system?